Want to build useful views but lacking inspiration? We've got you covered! Below, we will show you several examples of real-world tested views, why they're useful, and some ideas of specific panels you can add to create the view. This style of view is helpful if you oversee a merchandising team out in the field. Using a combination of just a few panels, you can quickly check which stores they visited, which tasks they completed, what their mileage driven was and more. In this instance, AV AccountHelper's default retailer is Home Depot. (By the way, changing your default retailer is as simple as clicking on that button and selecting your preferred retailer from the drop down menu that appears.) Why are we talking about default retailers? What is a default retailer and what does it do? The default retailer is the retailer that is automatically used when dragging and dropping a new insight panel onto a view. If you want to view Lowe's data when you drag and drop a panel onto a view, and your default retailer is Home Depot, you will be required to select Lowe's as the retailer in order to see Lowe's data appear on the insight panel. With all of this in mind, the value of creating a retailer-specific view suddenly becomes clearer. 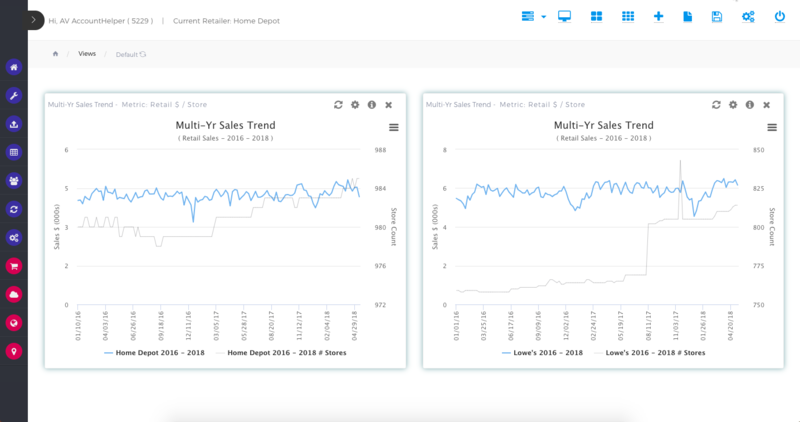 If you generally want your default retailer to be Home Depot, but you want to be able to quickly load a bunch of insight panels with Lowe's data, you can address this by creating a Lowe's-specific view. Dragging and dropping whatever assortment of insight panels you want, changing the displayed retailer for every insight panel to Lowe's and then making sure you click Save View is all it takes to quickly and easily build a view where everything Lowe's is right at your fingertips. Every Avantalytics account comes with 24 customizable categories. What this means is that you are given 24 different ways to compare your items. Perhaps you want to be able to organize by name, but also by size, color, product type and so forth. It's incredibly helpful to be able to slice data different ways, and the Category Overview insight panel is one of the simplest ways to display live data on a view. The limitation of this panel is that it can only display one category type at a time. How do we get around this problem? Well by creating a view with multiple Category Overview panels on it! Just drop as many Category Overview insight panels as you want onto a view, click the "Settings Gear" on the upper-right hand side of the panel and select the category for which you want data displayed. 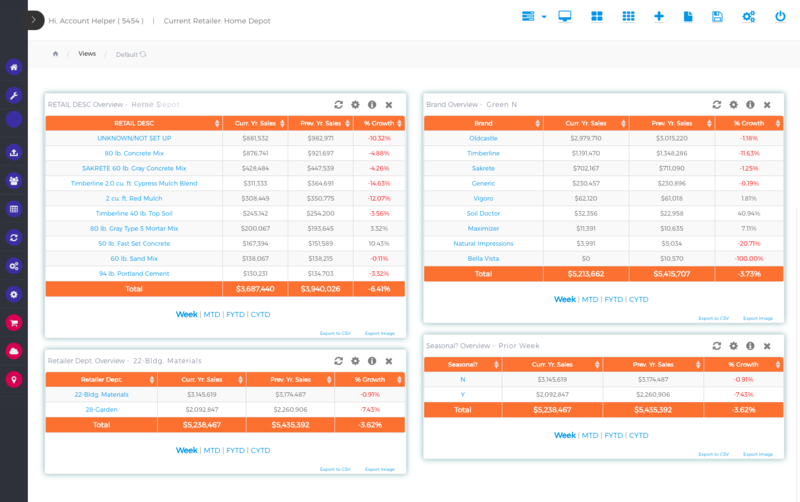 In less than a minute, you have the ability to look at sales data across several categories. The name is fairly self-explanatory. You layer multiple copies of any type of time-related insight panel into a view and change the time period in each panel until you have the assortment of time periods you like. Our Days of Rain insight panel beautifully displays the benefit of layering different time periods. 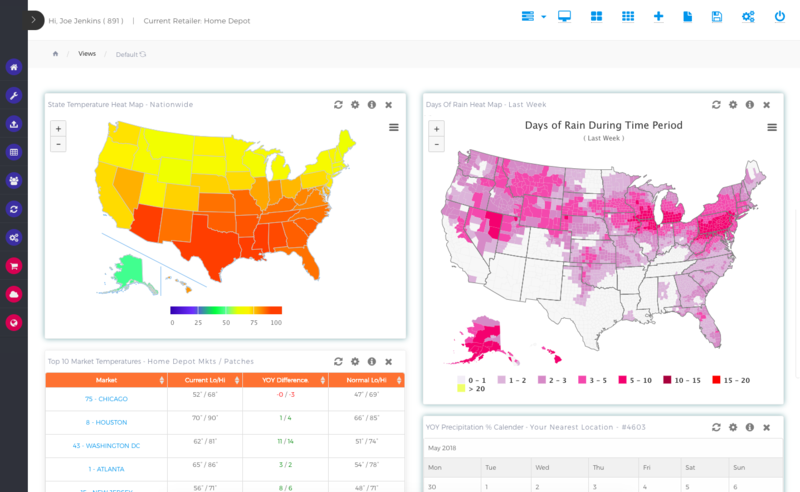 In the example below, you will see how helpful it can be to see the days of rain throughout the country over the past week, the past month, the upcoming weekend and the upcoming week, keeping you in the know for parsing past sales data and predicting future sales data. The multi-retailer view is the theological opposite of the retailer-specific view. In this view, the objective is to pick any one insight panel that you find useful in tracking data that you are interested in, and then set each insight to a different retailer. 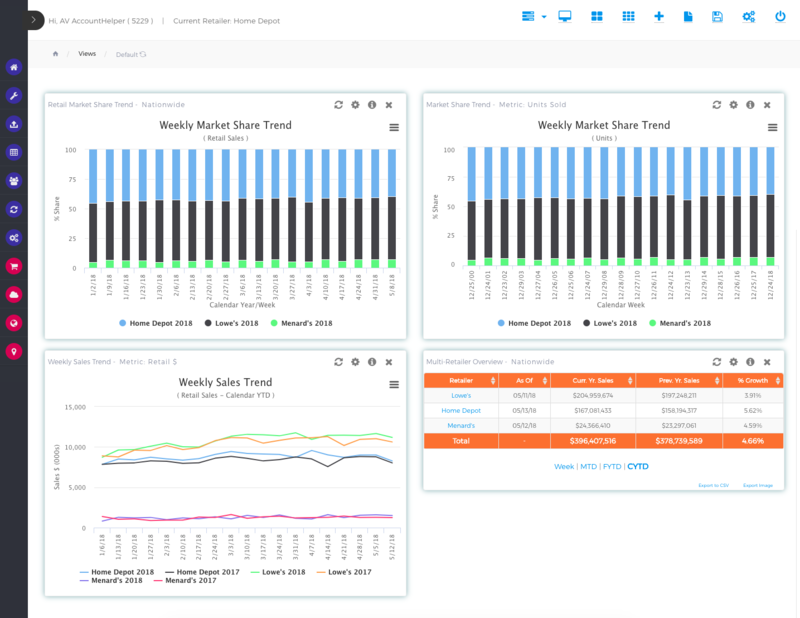 In theory, you can build a multi-retailer multi-view, if you wanted to be able to compare multiple retailers using different types of insight panels. If you want to know more about how to create and share multi-views, we have a great tutorial on how to do this. Otherwise, click below for an example of how to put together one multiple-retailer view. 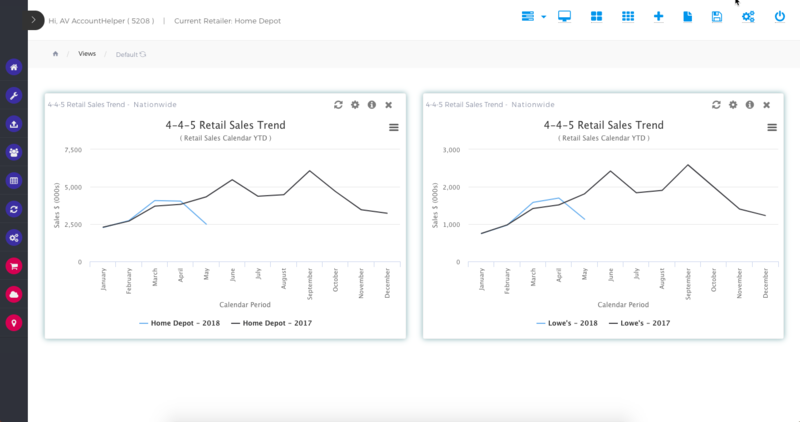 The difference between the multiple-retailer view and the multiple-retailer panel view is that, in this exercise, we will put together a view consisting of different types of insight panels that are designed to display information for multiple retailers. Most of Avantalytics' insight panels display only one retailer at a time - the multiple-retailer view described in the example above this one is designed to solve how to display multiple retailers by using several copies of the same panel, each with information loaded fro a different retailer. This view will teach you which panels display multiple retailers at once, and how to build a view that will show the data in different ways, allowing you to truly have an eagle's-eye view of how your sales are doing across retailers. 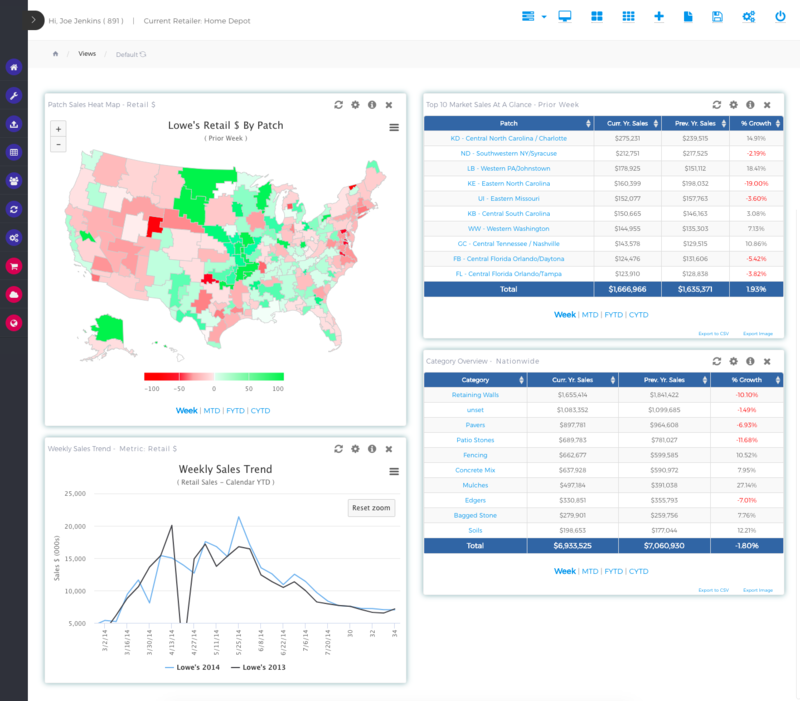 Avantalytics has a number of insight panels tailored to custom regions. If you don't know what custom regions are or how to set them up, you can learn about them here. 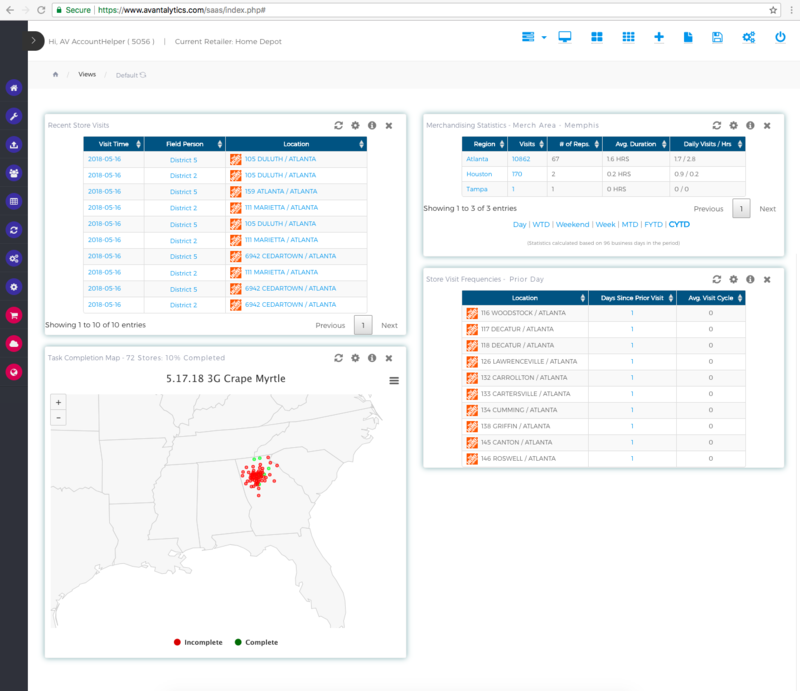 In short, custom regions allow you to track data in groups that you can designate yourself, allowing you to move beyond comparing data between existing data groupings such as zip codes, markets, patches and so forth. In this view example, we have created a custom region that tracks Home Depot sales in the Atlanta region, which is something a regional manager might find helpful to track. We then layer various custom region panels in order to have a quick understanding of what is going on in that region in map, graph and table formats. 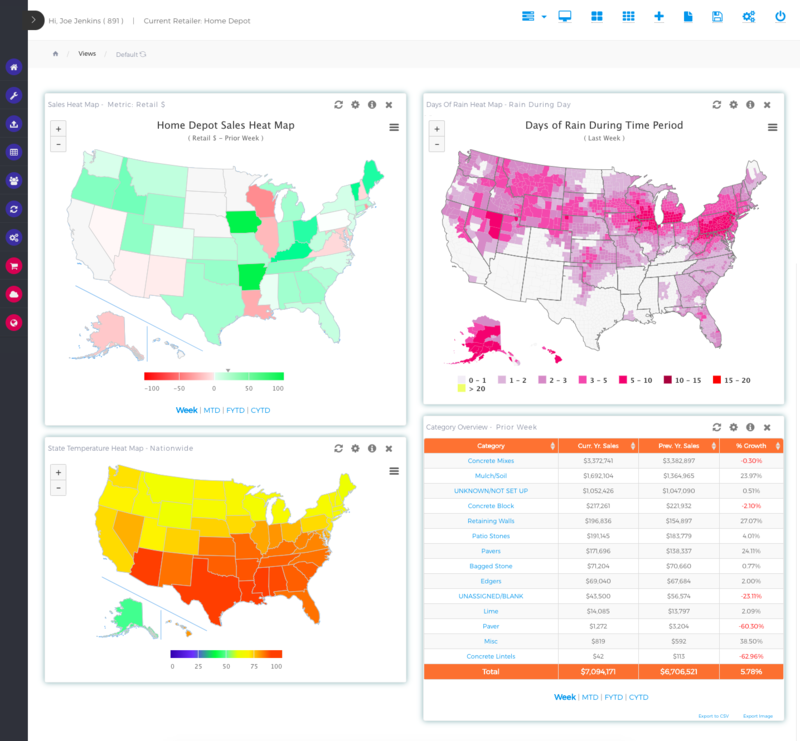 Weather is incredibly important to sales, so Avantalytics makes a point to offer an assortment of insight panels specifically tailored to tracking weather data. 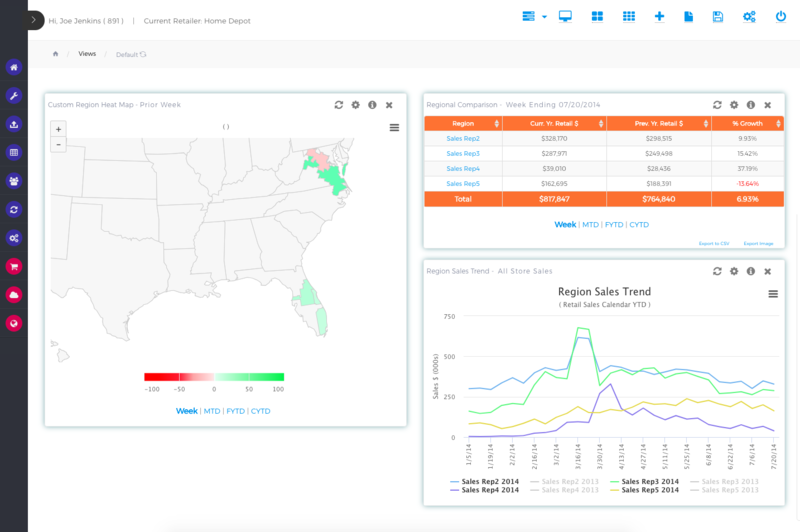 Mixing weather-related insight panels with your sales insight panels, making sure the panels are all set to measure the same time period, is an easy way to build a view that quickly tells you the impact weather is having on sales all over the country. In the example below, we paired one sales map with a rain and a temperature map and finished the view off with a table of sales data, all set to track the prior week's data. The strength of this view is that you can quickly see whether and where precipitation or temperature might have affected sales, and what the sales breakout is, all in one view. 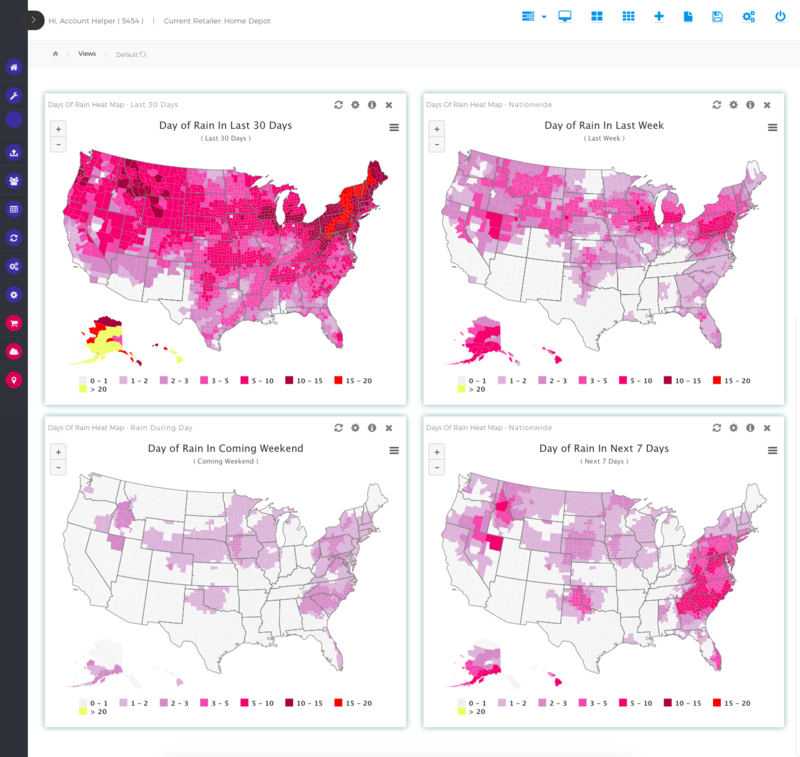 Maybe you just want all weather-related data in one place. This example view will show you how layering a number of Avantalytics' weather-related insight panels together gives you an expansive view of the weather. The below view would allow you to see how precipitation and temperature might be influencing one another, how temperatures compare to last year in key markets, and tracks a month's worth of temperatures in a key market, all in one view.